Where did America’s War for Independence really begin? For two centuries, two towns have battled over bragging rights. A controversy ignited by a visit from the Revolutionary War hero Lafayette eventually escalated into open warfare involving accusations, depositions, and even a sitting president of the United States. 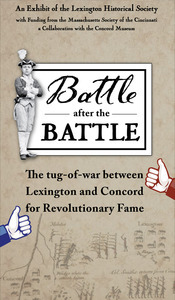 A new exhibit The Battle after the Battle takes a lighthearted look at two centuries of “local bickerings and petty jealousies” between the two towns, complete with bold graphics, historic artifacts, audio content, and hands-on displays. Visitors will be invited to vote for themselves whether Lexington or Concord has the better claim as the place the American Revolution really began. Rick Beyer is a co-curator of the exhibit, and will attend the exhibit grand premiere, as well as the 2 PM ribbon cutting for the restored Buckman Tavern.